Free concert? Yes, pls. Get rewarded with local discounts and free tickets through Verizon Up for simply paying your monthly bill! The older I get, the more my concert-induced stress rises. Huge crowds, long lines, and hours of people pushing and shoving one another can ruin what should be an otherwise fun experience. Yeah, yeah, I realize how scroogey that sounds, but sometimes your boy needs to just binge-watch 'n' chill at home away from throngs of screaming people. In spite of these ~reservations~ about the live music experience, I've admittedly missed, well, just that: the live music. 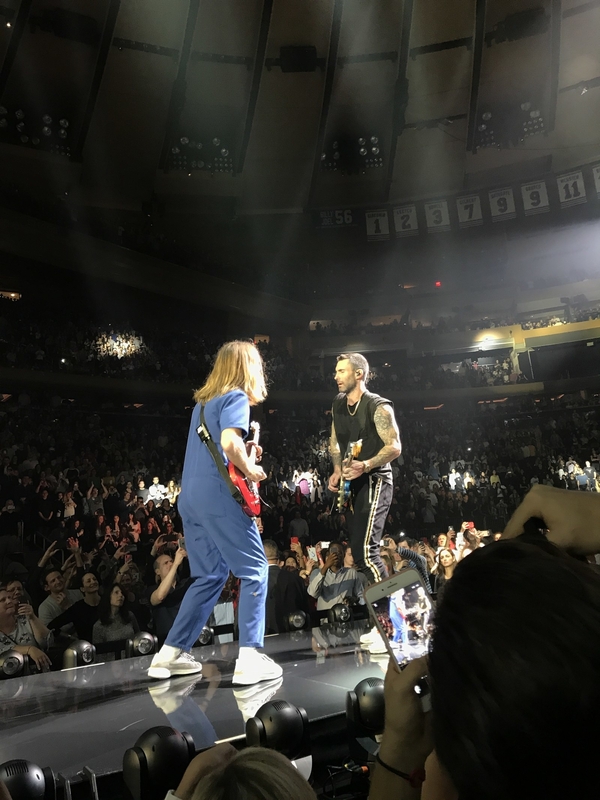 So when I had the opportunity to attend a Maroon 5 concert as a V-I-freakin'-P through Verizon Up, I saw it as a chance to give the scene another chance from a slightly different point of view. My friend Adrienne and I were very excited to be VIPs, if it weren't already obvious. This isn't even zoomed in. But forgive me — I've jumped way ahead of myself. Before the concert started, the other Verizon Up ticket holders and I used our fast passes to skip the line and get in early, which was a blessing for someone like me who hateshateshates crowds and lines. (Pro tip: ANY VZUp members can get early and expedited access to the venue, not just VZUp ticket holders.) Then we got an exclusive look backstage at where the pre-magic happens from Chris Maguire, Maroon 5's day-to-day manager of eight years. 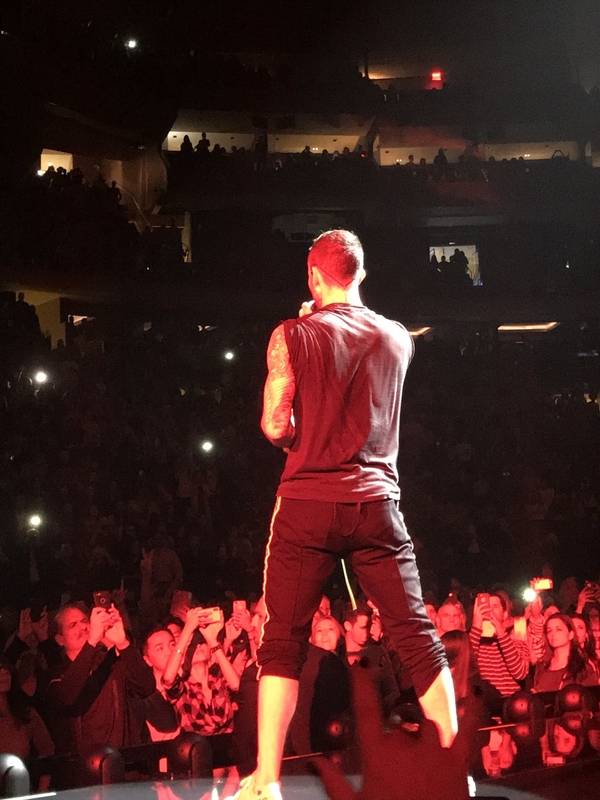 He took us on a tour through Madison Square Garden, showing us everything from the band's friends-and-family room to the hundreds of boxes of equipment waiting to be reloaded once the show ends. I'd never gotten a behind-the-scenes look at a huge touring group's show before, and it really put into perspective just how much hard work goes into every performance by people who get none of the applause. 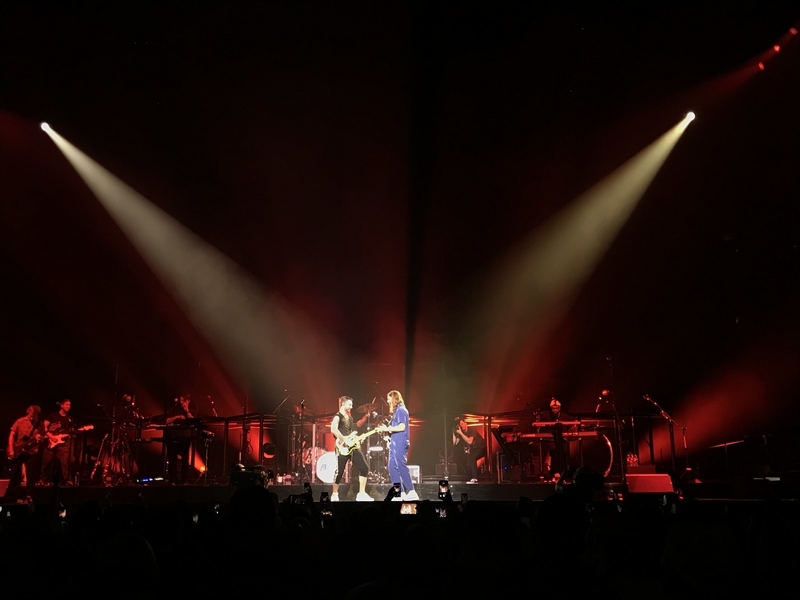 I also learned that Maroon 5 tour with a nonprofit organization whose goal is to make concerts greener and inform concertgoers about environmental concerns. Maroon 5 have been partners with the nonprofit for over a decade and travel to 34 cities with them, Maguire told us as we stood outside their room. Later I saw people selling green water bottles (adorned with images of the band, of course), the proceeds of which went toward the organization. Then we got to walk through the soundstage and venue before other fans were let in. 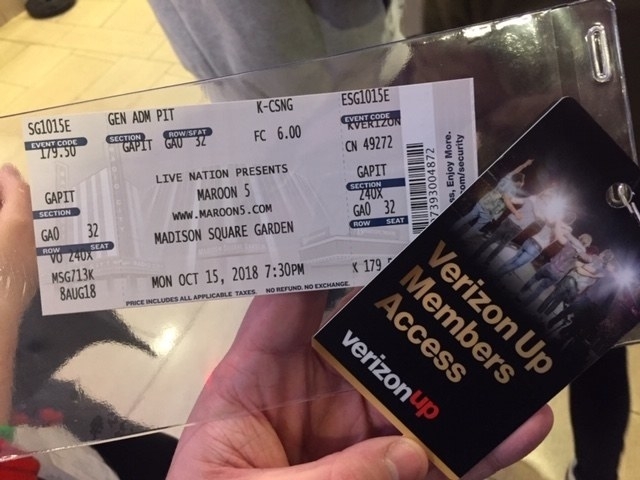 We watched as ushers and crew members mingled, finalizing plans and making last-minute adjustments before the show — and I gotta say, it felt pretty awesome to be able to flash my VZUp pass for easy access almost anywhere on the GROUND FLOOR. Before leaving us, Maguire explained how ~70 crew members start cleaning up five minutes after the encore ends. They're able to pack up everything in about five hours, then everyone immediately hits the road again. I felt tired just thinking about it. We're part of the band now, OK? Soon, the venue filled to capacity, which would normally instill next-level amounts of anxiety in me, but because we had our own little section, I was actually feeling pretty great. The opening act sufficiently pumped us up, then soon after, a classic scene from Back to the Future started playing on a gigantic screen in front of us before Adam came out in sneakers and joggers to wild applause and cheers, looking very McFly. Maroon 5 put on a truly great show I appreciated even more after seeing the work that went into it behind the scenes, and feeling like a VIP truly reinvigorated my desire to see more live shows soon. I know I can't always be 10 feet from a nationally touring band while they perform, but I'm so glad I had the experience — it improved my outlook on all future shows I'll go to. For the first time in a while, I can't wait for the next one. 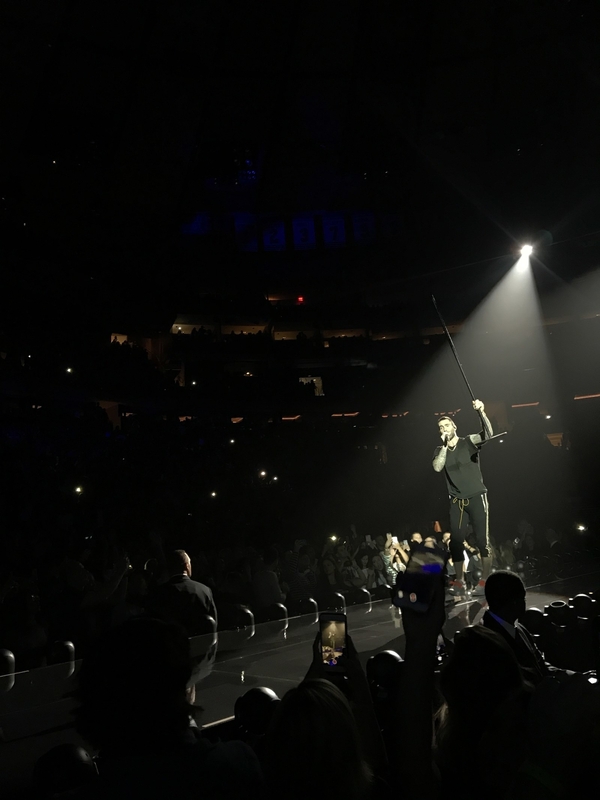 Get tickets to your favorite sporting events, live experiences, and concerts (like Maroon 5!) with Verizon Up.